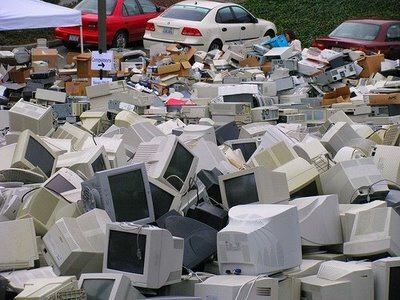 Saturday, May 29, from 9 a.m. to 3 p.m. – If you’ve been itching to get rid of those old computers, keyboards, printers, monitors, laptops, scanners, shredders, fax machines, phones, answering machines, TVs, VCRs, cassette players, stereos and other electronic equipment, as well as used household batteries, bring them to our e-waste recycling event in the Brookside Park parking lot! Saturday, May 29, from 10 a.m. to 3 p.m. – It’s Family Fun Day at La Pintoresca Park and La Pintoresca Branch Library! Bring the kids for skate park and basketball competitions, arts and crafts, live entertainment, food, prizes and much more! Monday, May 31, at 11 a.m. – The Pasadena chapters of the Vietnams Veterans of America and the Navy League will host a wreath-placing ceremony at the Pasadena Vietnam Memorial at Memorial Park on Raymond Avenue between Walnut and Holly streets. Wednesday, June 2, at 7:30 a.m. – Walk around the Rose Bowl Loop with Mayor Bill Bogaard and the Pasadena/Foothills Chapter of the United Nations Association. 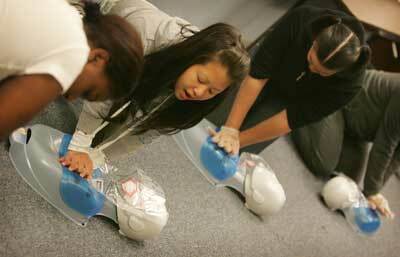 Meet at Gate A.
Sunday, June 6, from 1 to 5:30 p.m. – The CPR Awareness and Health Fair at Victory Park, 2575 Paloma St. (in the gymnasium and on the park grounds), will include hourly hands-only CPR training with mannequins, yoga and karate demonstrations, indoor boot camp, blood pressure and spinal screenings, arts and crafts, and much more. This event is co-sponsored by Pasadena City Councilman Steve Haderlein. Through June 20 -- Allendale Branch Library, 1130 S. Marengo Ave., is closed for installation of a new HVAC system. If this is the library nearest your home, the next closest locations are Hill Avenue Branch Library, 55 S. Hill Ave.; San Rafael Branch Library, 1240 Nithsdale Rd. 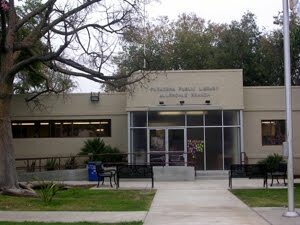 ; and Pasadena Central Library 285 E. Walnut St. 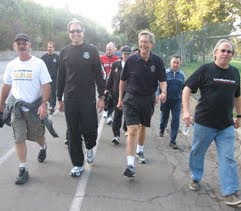 The photo of the mayor's walk is courtesy of the Pasadena Weekly. I stumped everybody this week. It was a bit of a trick photo because it's so out of context. 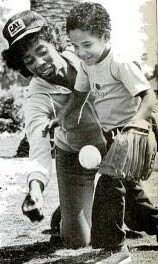 In the photo above, shot in 1982, Pasadena's first female mayor plays ball with her five-year-old son Sam. 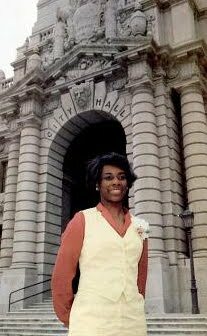 The fact that Pasadena's first female mayor was African American was big news. All of the black-and-white photos, with the exception of the one at the bottom, in this post are from a feature in Ebony Magazine. Here she is in the City Hall tower. It was encouragement and support from a lot of people that made Mrs. Glickman consider a political career. Two of those who urged her on were Paul Law, now a retired Pasadena city employe and businessman, and the Rev. David Scott, who is affiliated with Pasadena's First A.M.E. Church. Mrs. Glickman is a former jazz singer in small local clubs, and she toured with the New Christy Minstrels before giving up her career in 1975 to start her family. Two years later she heeded the urgings of Law and Rev. Scott and other neighbors and began campaigning for office as city director from District 3 in Northwest Pasadena, a predominately Black area. She won and was reelected last year. She served as vice mayor for a while before being elected Mayor by her fellow city directors. 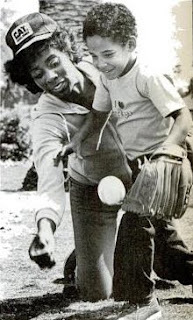 She had two sons: the other in this photo is Jason, 6. 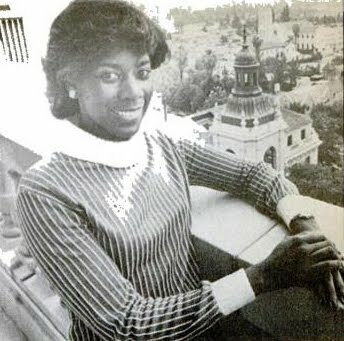 During her political career she made local government more accessible to residents of Northwest Pasadena, resulting in residents becoming more politically astute and more involved in civic affairs. She served on the Pasadena City Council until 1989. Sadly, she passed away March 18, 2001, in Lubbock, Texas, where she moved after being remarried. I wrote a tribute to her in the May 2001 issue of Pasadena in Focus. Last night I was among the honorees at THE Magazine's 50 Fabulous Women of Influence event. It was so nice to be among so many other hard-working San Gabriel Valley women and hundreds of guests. There was food, wine and friendship during a big reception outdoors in the Metro right of way*. After THE Magazine Publisher Steve Tobia opened the formal program, Mayor Bill Bogaard spoke to the gathering of 300 people. Each of the 50 women** was introduced and presented with roses from Piccolo and certificates from U.S. Rep. Adam Schiff and California Senator Carol Liu. Thanks to so many people who came to support me, including (left to right below) Vannia De La Cuba, field representative to Pasadena Vice Mayor Victor Gordo; Tom Coston; and Pasadena City Councilwoman Jacque Robinson, as well as Ben Green, Judy Kent, Jan Sanders and many more. The really cool thing about the evening was that each of the honorees chose a favorite local charity, and people made pledges to support them. Mine was Mothers' Club Family Learning Center. I was president of the board of directors several years ago and recently co-founded an advisory group made up of all the former board presidents. I can't even tell you how many people I cajoled, I mean dragged, I mean encouraged, I mean insisted on making a pledge to Mothers' Club! I purposefully cropped this photo to protect the privacy of the pledgers. It resulted in many hundreds of dollars for Mothers' Club and more than $25,000 cumulatively for all 50 of the local charities. I want to give a special shout-out to Sarah Orth, development director at Mothers' Club. She stood there all evening at our little table, providing brochures and verbal information to all my pledgers. *The asphalted alleyway above underground Metro Gold Line tracks. After receiving permission from Metro, the chain-link fencing has been removed and the City of Pasadena has been installing benches, planters and other items to create a more engaging sense of place. ** Agnes Grohs, entrepreneur/humanitarian; Amanda Stephanovich, pharmaceutical executive/community volunteer; Ann Erdman, public information officer/community advocate; Anna Addis, management executive/community advocate; Barbosa Polverini, local developer/arts advocate; Cherie Saxton, artist/education advocate; Christina Avaness, nutritionist/author; Christy Zamani, non-profit executive/youth advocate; Deanne Carnighan, educator/arts entrepreneur; Debbie Manners, non-profit executive/health advocate; Diane Cullinane, medical director/health advocate;Dianne Philibosian, educator/youth advocate; Dolores Hickambottom, lifelong community activist and advocate; Doreen Garcia, non-profit executive/substance abuse prevention advocate; Elsie Benton, non-profit executive/substance abuse prevention advocate; Felicia Williams, green energy executive/environmental advocate; Franci Levine Grater, community volunteer; Gail Ellis, college counselor/philanthropist; Gale Kohl, restaurateur/community volunteer; Heather Sturt Haaga, artist/non-profit executive; Helen Morran-Wolf, non-profit executive/community volunteer; Houry Aposhian, banking entrepreneur/community volunteer; Irene Quinones, educator/youth advocate; Jacqueline Bracy, OB-GYN/women's health advocate; Jeri Nichols-Sutherling, healthcare executive/disabled-youth advocate; Jill Underwood, hospital executive/animal advocate; Joy Sullivan, entrepreneur/community volunteer; Joyce Chang, multicultural entrepreneur; Julia Rodriguez-Elliott, artistic director/arts advocate; Julie Giulioni, parent/education advocate; Karen Davis, civic leader/mentor; Linda Taix, fitness entrepreneur/community volunteer; Liz Rusnak Arizmendi, auto executive/community volunteer; Mercy Tolentino Steenwyk, entrepreneur/mentor; Mikala Rahn, educator/education advocate; Nikki Vitale, fashion entrepreneur/community volunteer; Pat Anderson, chamber executive/civic leader; Patti Carmalt-Vener, psychotherapist/arts advocate; Rachel Fine, non-profit executive/youth advocate; Sandra Troup, interior designer/community leader; Sharon Hawkins, healthcare entrepreneur/seniors advocate; Sindee Riboli, entertainment executive/community volunteer; Sue Mossman, heritage advocate/civic leader; Susana Porras, non-profit executive/teen advocate; Tahra Goraya, state senate district director/community advocate; Terre Osterkamp, OB-GYN/education advocate; Ursula Hyman, attorney/community volunteer; Valereen Essandoh, executive/philanthropist; Wenonah Valentine, non-profit executive/youth health advocate; and Yolanda De Garcia, AIDS awareness advocate. 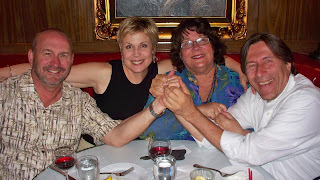 Tom Coston and I had dinner with Ben and Kelly Green on Wednesday evening at Colombo's in Eagle Rock. Ben had just given Tom and me a private VIP tour of the Showcase House of the Design, which this year is the Cravens Estate, also known as Red Cross headquarters. It has been magically transformed and we were grateful for the free, behind-the-scenes access. Ben Green and I have known each other for nearly three decades. 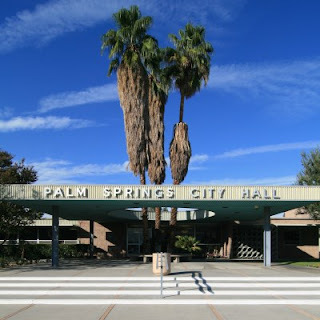 We were the two division managers in the Department of Community Services and Promotions at the City of Palm Springs in the 1980s. Ben headed up the Community Services Division -- parks and recreation plus the library. I headed up the Promotions Division -- media relations, community relations, special events, press secretary to Mayor Sonny Bono. Those were heady days, I'll tell you. At dinner Wednesday we talked awhile about Henry Weiss, who was the lead city librarian in Palm Springs and reported to Ben. Henry's retired now, but there were a couple of times when we'd had it up to here, Henry would fire up his Corvette convertible, speed on down some back desert road and I'd stand up on the passenger seat, assume the "I'm the king of the world" position and yell at the top of my lungs. Now I'm so old I wouldn't even think about taking off my seatbelt to do anything so reckless. I'm going to Palm Springs next Thursday for my annual romp with other golden-ager PIO pals. Chris wins with his 7:05 a.m. Tuesday guess 'Beer or? boys'?? 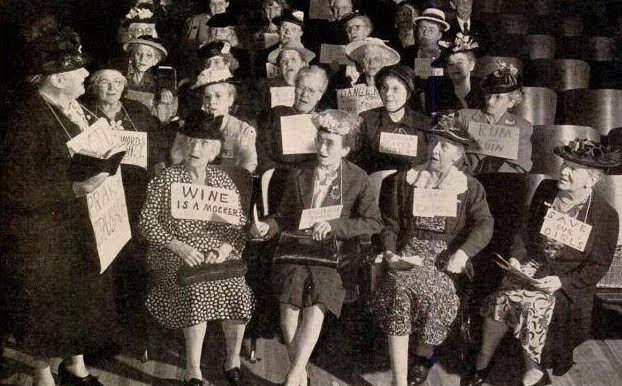 They look like the Women's Christian Temperance Union gals who protested at bars around the country, especially in Pasadena, in the 40's. Or maybe they're that evening's live karaoke. The bartender likes them." 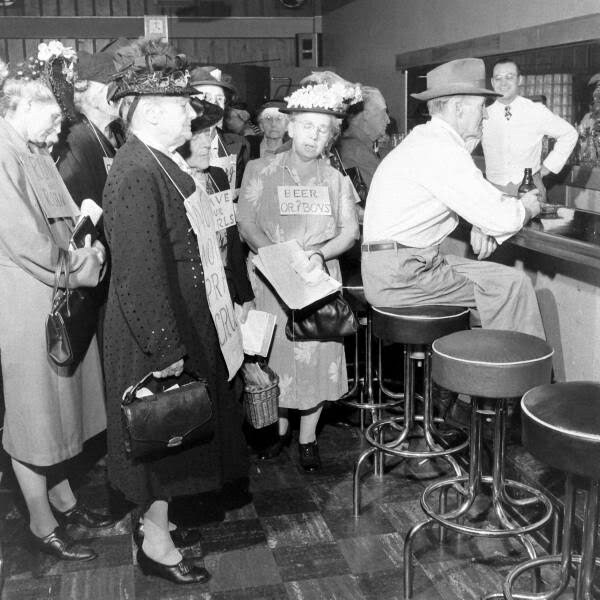 In the 1947 photo above, members of the Woman's Christian Temperance Union chide a customer in a Pasadena bar. The WCTU visited several drinking establishments in Pasadena that day, and they knew how to work a publicity machine. 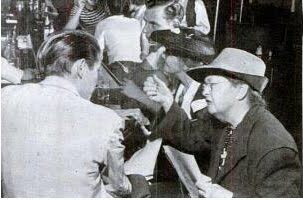 Life Magazine covered their day-long mission and published several photos in the May 19, 1947, issue. These marching grandmothers will seem strange to many younger Americans. But to older people, who can recall the violent days of hatchet-wielding, saloon-smashing Carry Nation, they will seem like nothing more than a wisp out of the past. In their own simple and direct way these women are exhibiting a peculiarly American penchant for reform by a peculiarly American form of enterprise. These ladies have replaced the direct action of earlier days with persuasion. 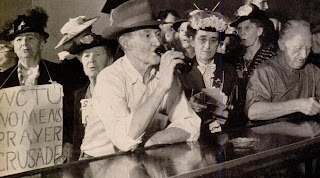 Like members of other dry organizations who are becoming active again, they are advocating measures short of an immediate campaign for outright prohibition. Using only prayer and petition, and guided, as they believe, by God, they paraded last week into barrooms of Pasadena, Calif. There they urged barkeepers to seek "more honorable" jobs. They pointed out possible law violations to proprietors. They pleaded with customers to sign no-drink pledges. At one bar they found a mother with her daughter, embraced the mother and prayed for her. Later the mother joined them in singing "Onward Christian Soldiers." The marchers are, of course, Woman's Christian Temperance Union members. They are led by Mrs. Bessie Lee Cowie, 86, one of demon rum's most persistent foes. Tears came to Mrs. Cowie's eyes as she said, "Again and again girls have told me that their fall began with a glass of wine." 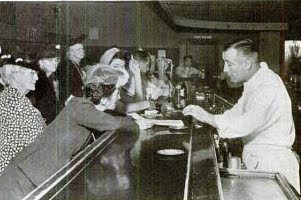 The barroom customers, however, appeared to have the attitude of Finley Peter Dunne's Mr Hennessy, who once remarked to the more famous Mr. Dooley, "Th' man who dhrinks modhrately ought to be allowed to have what he wants." Dooley's reply was, "What is his name? What novel is he in?" 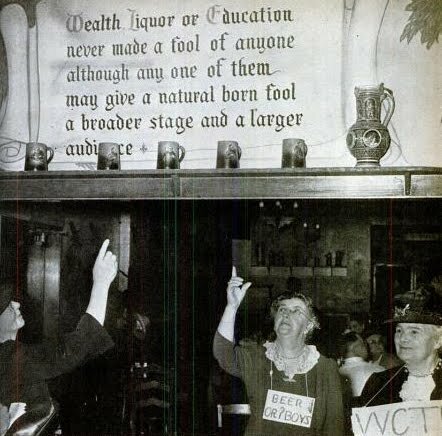 There's a Southern California chapter of the WCTU. 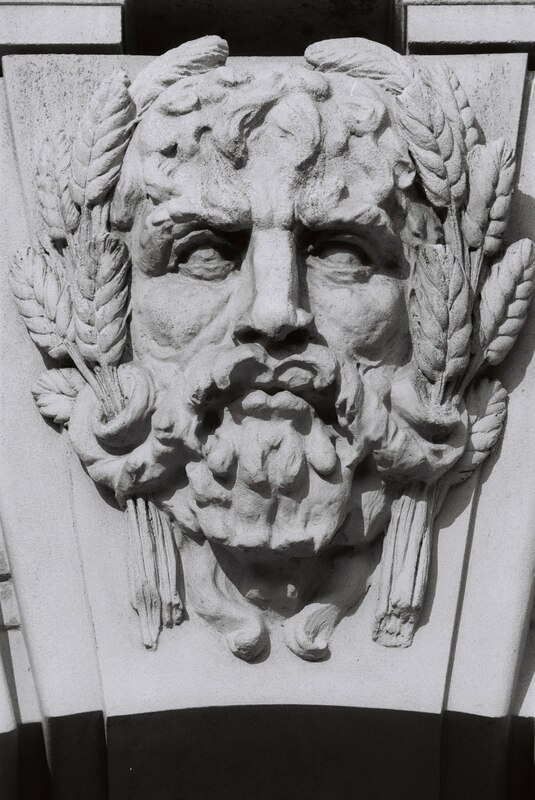 I keep promising to do a post about how liquor was involved -- or not -- in Pasadena's founding. It's a fun and fascinating history, but too much info for this post. I will, I will! Pasadena's finest came to the rescue yesterday at about 3 p.m. Firefighters from Stations 31 and 39 used the jaws of life to extricate an injured person from this car that crashed on the 710 Freeway at Del Mar Boulevard. The jaws of life is a heavy-duty pneumatic tool that is used to pry sections of a wrecked vehicle apart. Many thanks to Pasadena Fire Department for the photos. Some local bloggers have been asking me for long time if I would do a bloggers-only tour of City Hall. On Saturday I showed about 20 bloggers my home away from home, including some of the unique architectural elements (can you find an upside-down artichoke? a whimsical, mustachioed face? a castle?) and provided a lot of historical background information. Then we went across the street to CPK for some pizza. Bloggers who couldn't make it on Saturday are asking for a rain check. We'll do it again someday, I promise! Many thanks to Brigham Yen (top row, second from left) for the photo and Mike of the Cafe Pasadena blog (bottom row, second from right) for all the moral support! Don't You Dare Say There's Nothing to Do in Pasadena! Saturday, May 8, from 8 to 11 am. 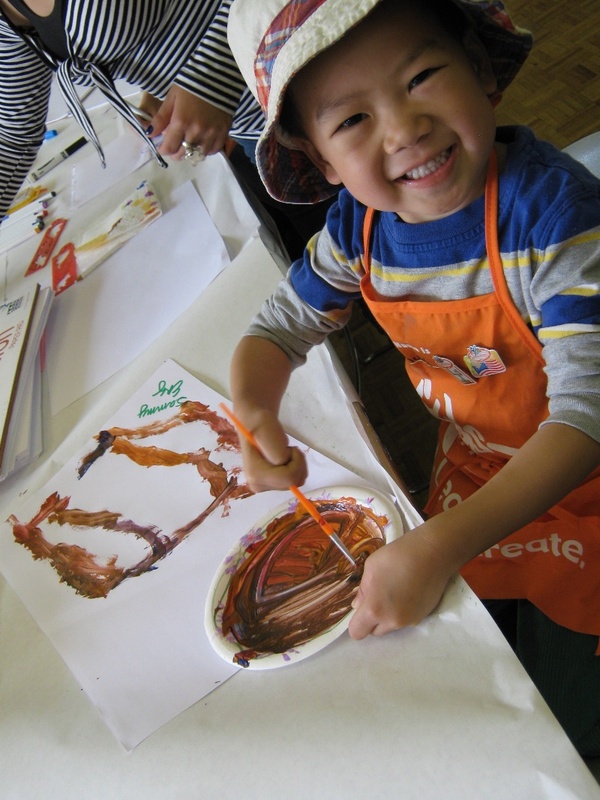 – Help create a children’s butterfly garden at Hastings Branch Library. Saturday, May 8, from 9 a.m. to noon -- Are you interested in how open space in Pasadena is acquired and preserved? Voice your opinion and learn more during a workshop. Saturday, May 8, from 10 a.m. to 2 p.m. – Celebrate the fifth anniversary of the remarkable Arlington Garden! 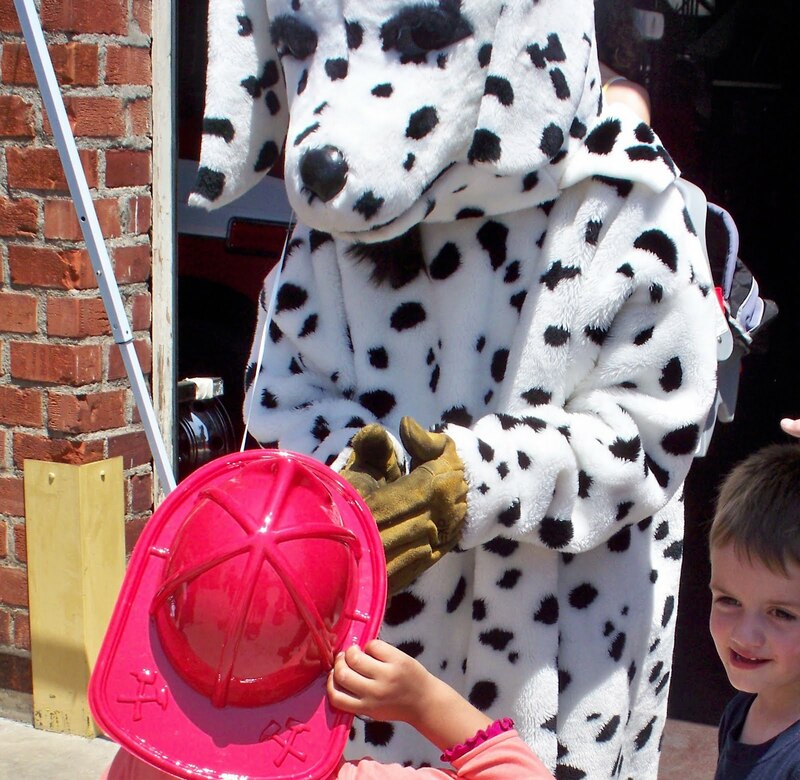 Saturday, May 8, from 10 a.m. to 4 p.m. -- Meet the dedicated men and women of the Pasadena Fire Department during open houses and death-defying demonstrations! Saturday, May 8, from noon to 3 p.m. -- If you're a local blogger, come to a noon tour of Pasadena City Hall just for you, followed by a 2 p.m. lunch/snack/beverage/whatever-you-feel-like at California Pizza Kitchen across the street. 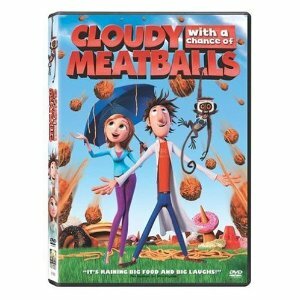 Tuesday, May 11, at 3 p.m. – La Pintoresca Branch Library, 1355 N. Raymond Ave., presents the children’s film “Cloudy with a Chance of Meatballs.” Bring your little ones -- we’ll even provide the popcorn! 744-7268. 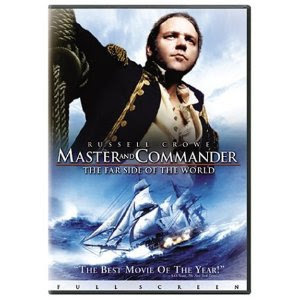 Wednesday, May 12, at 1 p.m. – This week’s film in the Donald R. Wright Auditorium at Pasadena Central Library, 285 E. Walnut St., is “Master and Commander: The Far Side of the World” (2003, PG-13) starring Russell Crowe. 744-4066. Also on Wednesday, May 12: Today is the deadline for Historic Preservation Awards nominations. 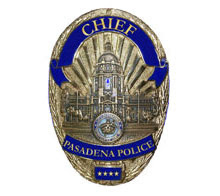 Thursday, May 13, at 11:30 a.m. – The Police & Citizens Awards Luncheon in the ballroom of the Pasadena Convention Center, 300 E. Green St., honors Pasadena residents, police officers and others who have gone beyond the call of duty to reduce crime and increase the quality of life in this community. Tickets are $40; to RSVP call Officer David Thomas at 744-4282. 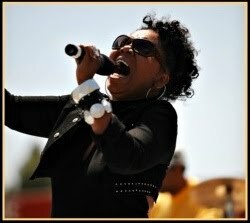 Saturday, May 15, from noon to 8 p.m. -- Enjoy nonstop live jazz at the Rose Bowl Stadium during Jazzy Jam 2010 to benefit local youth programs. $30 at the gate or $20 in advance. Children under 13 are free. SAVE THE DATE: The Pasadena POPS free concert “Music Under the Stars” in front of Pasadena City Hall is the orchestra’s annual gift to the community. This year it’s on Saturday, May 22, at 7 p.m. 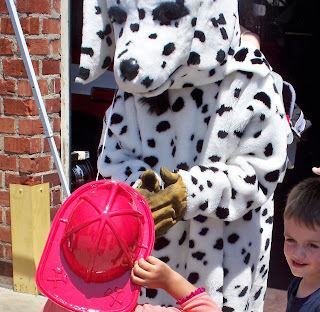 Arrive as early as 5:30 p.m. to picnic or purchase dinner from gourmet food trucks; little ones will enjoy children’s activities provided by staff from Kidspace Children’s Museum. Bring a lawn chair or rent a chair for $3. 11:41 A.M. UPDATE: That Bellis is a sneaky one! 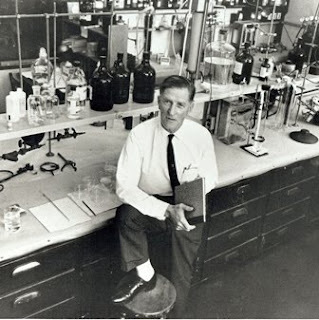 I didn't realize until just now that she posted an 11:34 p.m. guess last night: "I like the idea of Jack Parsons, but I think this is the Dutch chemist Arie Haagen-Smit (not to be confused with Haagen-Dazs) in his lab at Caltech." So she wins the fabulous prize! I scooped everybody this week, although Bellis posted her guess from a coincidental location! 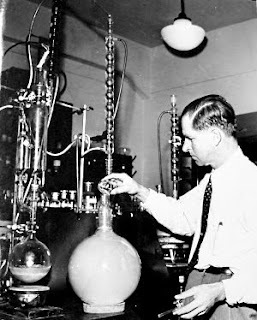 In the photo above, Caltech Professor Arie Haagen-Smit is in a campus laboratory demonstrating how smog is formed by photochemical reactions of unburned hydrocarbons, nitrogen oxides and ozone. Born in Utrecht in the Netherlands, this “father of air pollution control” is best known for finding a direct link between automobiles in Southern California and the heavy smog that plagued the region for decades. Ironically, Dr. Haagen-Smit was a heavy smoker. He died of lung cancer in 1977 at the age of 76. There’s a nice little tribute to him here by a Caltech biology professor who worked closely with him. Every year the State of California Air Resources Board presents the Haagen-Smit Clean Air Awards in his memory. Chip Jacobs has a smog blog. And see a recent L.A. Times article here. As you probably know, there’s always a direct tie-in to local Pasadena government on all of my Mystery History reveals. So where’s the City of Pasadena tie-in for this one, you ask? Bike Week Pasadena is coming up in two weeks! There will be activities at Pasadena Museum of History, Central Park and other locations. Not a bike rider? You can still leave your car behind a take a Pasadena ARTS Bus, the Metro Gold Line (or even a combination of the two), or put on your walking shoes and get going! Many thanks to Caltech and the California Air Resources Board. 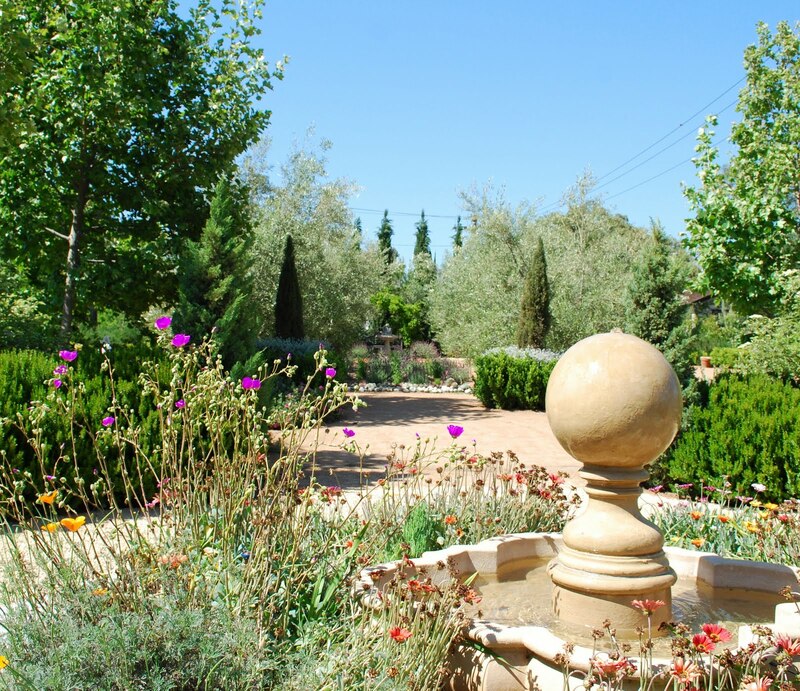 If you haven't been to Hamilton Park, it's in the Upper Hastings Ranch area, generally bounded by Cartwright Street to the north, Sierra Madre Boulevard to the south, Pepperhill Road to the east and Crestview Drive to the west. The back side of the park is across the street from PazNaz. If you have been to Hamilton Park, do you know it sits atop a reservoir? Yes, Jones Reservoir is doing its thing, with the help of our talented Pasadena Water and Power crews, below the surface. Pasadena Water and Power has 12 active wells that feed natural groundwater into 18 reservoirs throughout the community that also receive some purchased water from Metropolitan Water District. Jones Reservoir holds about 50 million gallons -- the largest capacity of all Pasadena's reservoirs (Lida Reservoir is the smallest). The blended water (natural groundwater and MWD water) is disinfected and then distributed to customers through a pipeline network of 478 miles of mains throughout the city. Ben Wideman did a nice post about Hamilton Park recently. 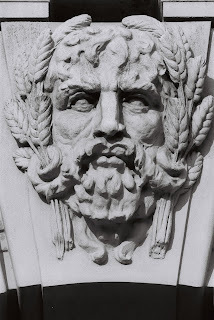 I've been doing an occasional series of blog posts about monuments and memorials in Pasadena. Here are the others I've posted to date. The photo of Hamilton Park and the memorial plaque were shot by the mighty Zack Stromberg of the Public Affairs Office. Many thanks to Brad Boman of PWP for the photo of the pumping station. There have been many requests for tours of Pasadena City Hall by local bloggers over the years, so now's your chance! Join me for a behind-the-scenes tour of the 1920s-era building, including background about the history and architecture of Pasadena's most famous landmark. We'll meet in the courtyard at noon, then go along corridors, into stairwells, all around the courtyard, up to the council chamber, into the Hall of Mayors, and every other little nook and cranny (with the exception of the tower, which is off-limits on tours). After the tour, we'll head over to California Pizza Kitchen across the street at Plaza Las Fuentes for food and those all-important beverages. 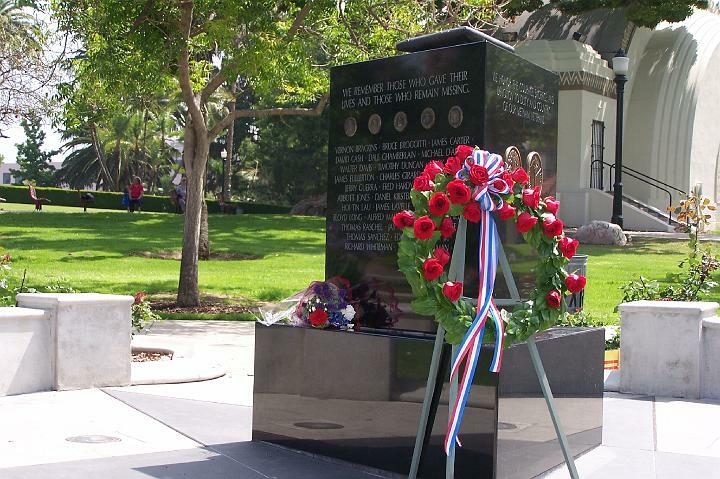 Parking: My best advice is to leave your car behind and take the Metro Gold Line to the Memorial Park Station, then walk a short block and a half to City Hall. If you're totally tied to your vehicle, the first 90 minutes are free under Paseo Colorado just a block away; there are also a couple of surface parking lots in the area. Please note I cannot provide parking validations. For more information e-mail me at aerdman@cityofpasadena.net or call me at (626) 744-4755. Please note this is not a "y'all come" community tour -- I can't accommodate a cast of thousands! For all you bloggers, I hope you can make it! All of the photos above were shot by Tavo Olmos; I commissioned the black and white photos in 1991.